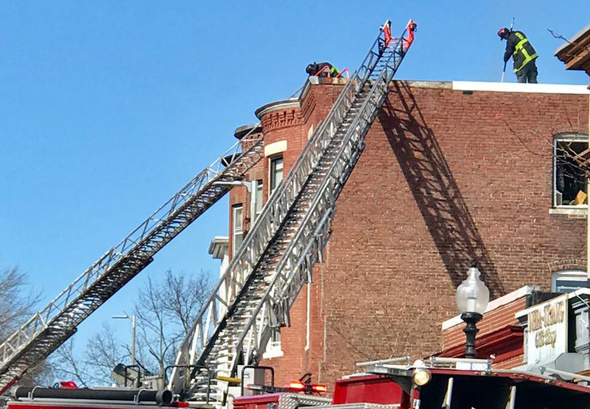 The Boston Fire Department reports a fire that started on the second floor of 184 Adams St. spread to the third floor. Firefighters responded around 1:15 p.m., the department says. Damage was estimated at $100,000 and the cause is under investigation. 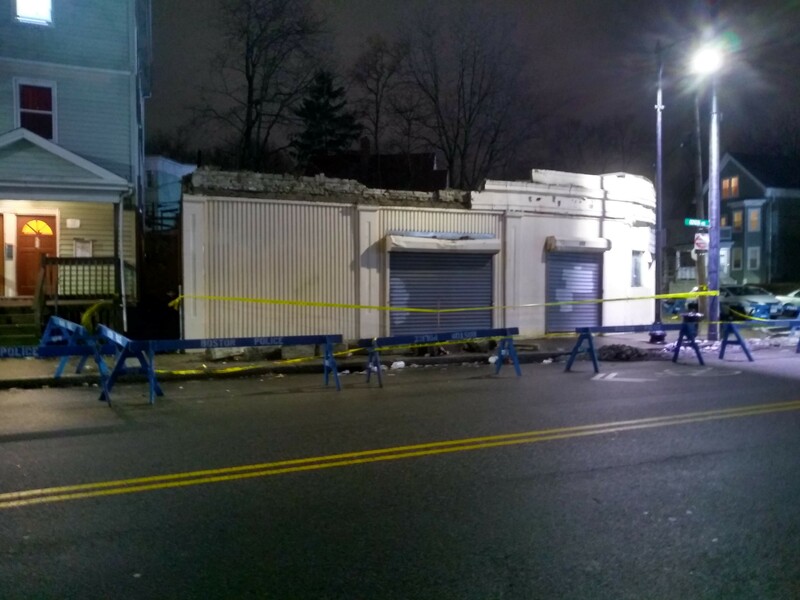 Around 9 p.m. on Thursday, a roving UHub photographer snapped the long abandoned building at 499 Geneva Ave., at Vinson Street, in Fields Corner after parts of it collapsed to the sidewalk. Fortunately, she reports, nobody was hurt (unlike what happened last fall in Allston). VietAid announced it's shutting its after-school program because of financial issues, but says it hopes to re-open them at some point. Read more. Firefighters look to extricate person under train. Photo by BFD. Red Line service came to a halt on the Ashmont branch around 8 a.m. after a person wound up under a train at the Fields Corner station. The T is using buses instead between Ashmont and JFK/UMass. NBC Boston reports the person was extricated shortly before 9 a.m., conscious, with possible broken bones. Boston Police report arresting a South Boston man yesterday on charges he shot another man on Dorchester Avenue at Adams Street around 2:15 p.m. on Dec. 31. Read more. Vivian Gerard's security camera caught a pedestrian getting mowed down at the intersection of Dorchester Avenue and Adams Street in Fields Corner about 11:30 a.m. on Wednesday. Read more. Victim identified as Alicia Restrepo, 24. Boston Police report a woman, 24, was shot several times on Charles Street near Ditson Street, around 9:35 p.m. Read more. Update: Victim identified as Marlon Richardson, 19, of Dorchester. Boston Police report a man, 19, was fatally shot around 2:10 a.m. at 12 Vinson St. in Dorchester. Read more. 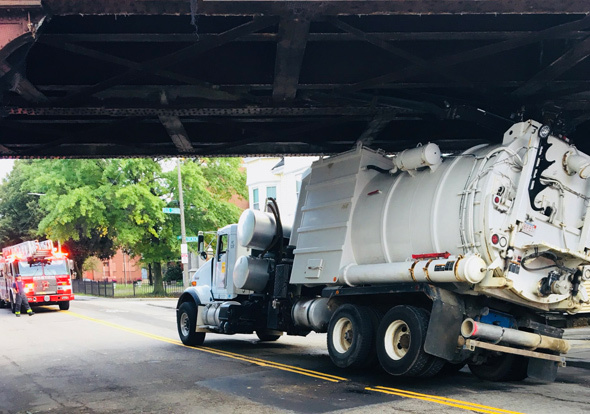 The Boston Fire Department reports no injuries after a truck driver wedged his truck but good under the Red Line tracks on Adams Street near Lincoln Street around 7:30 a.m. Read more. The Dorchester Reporter updates us on the proposal. The Board of Appeals ruled yesterday a Fields Corner resident has to get a school bus he's turning into a camper out of his driveway. Read more. After finding a bit of cable on the sidewalk on the way home last night, a Fields Corner resident took a look at the day's video from her surveillance system - and watched this slob getting the bike ready for the taking, only he couldn't cut through the second chain securing it and gave up. She adds she knows the bike's owner, who told her he had not asked for help from this Lance Armstrong doppleganger to free it. Cambridge Police report arresting Jean Griffin, 41, of Fields Corner, on a variety of charges - including armed assault to murder - for an incident Saturday in which several rounds were fired into a second-story residence at Elm and Cambridge streets. Read more. 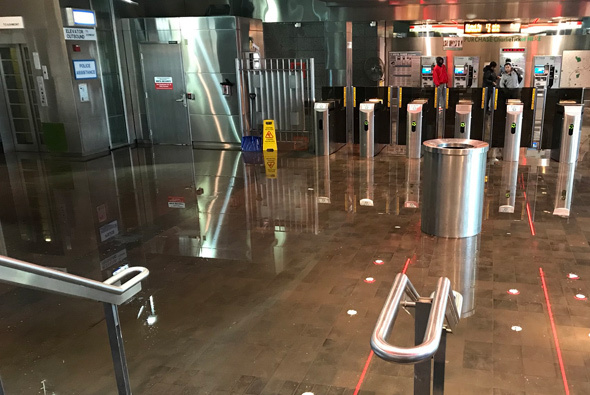 Bobert Fallon reports the station lobby is filled with water, but that you can still catch the train there, as long as you don't mind wading through a few inches of water to get to the track level. 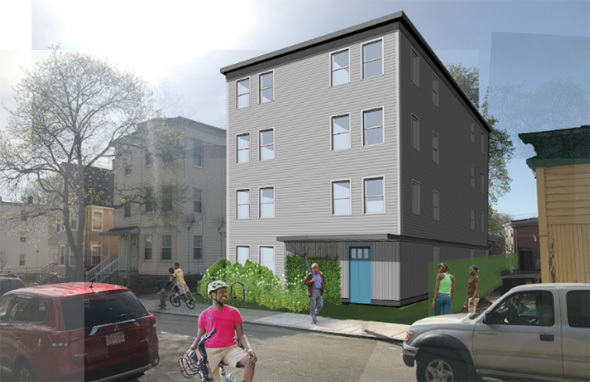 The Board of Appeal today gave provisional approval to plans by the owners of Churrascaria Vulcao, 203 Adams St. in Dorchester, to bring in a violinist and one or two guitarists to serenade patrons. Read more. Fields Corner Main Street shows us the sunset over Dorchester Avenue tonight. Boston Police report arresting Jude Despage, 18, on charges he used a knife to hold up three women Thursday and that he is also suspected of robbing two more on Friday - and sexually attacking one of those. Read more. Crime scene extends to Adams and Dorchester Ave. Photon by Ryan Somerfield. In the back, around 3 p.m. at Draper and Westville streets. There's a related crime scene on Adams Street, just north of Dorchester Avenue.